Google Analytics offers a visualization of a website’s sales funnel, the process through which a lead has to pass on the way to becoming a customer. Track your users through the funnel, spot where they fall out and you can increase your conversions by improving the pages from which they leave. Email marketers have a sales funnel too — but it doesn’t work in quite the way you think. The funnel appears to be simple and short. It seems to start with the message. The email contains some tempting text and an invitation to click through. The landing page provides the next (and final) stage by pitching the service directly and offering a call to buy. In fact though, an email marketing sales funnel is much more complex and a great deal longer than that two-step process. It winds rather than extends and it takes time rather than relying on the speed of a quick two clicks. The funnel actually begins long before the first email is sent, when the visitor reads the text next to the subscription box. That text doesn’t just invite the user to submit his or her email address; it sets the tone for the relationship and establishes the expectations that they can reasonably have during their time on your email list. That text promises that subscribers will receive a particular kind of information: marketing news, for example, or announcements of special offers. As long as that information continues to come in, the subscriber will remain in the funnel. He or she might not buy but they won’t have disappeared. If the purchase doesn’t come with that email it might come with the next one. Leads only fall out of the funnel completely when they hit the unsubscribe link — an easy move to measure. Each email that doesn’t produce a sale extends the funnel a little further. But it should also move the lead closer to the purchase by building a relationship with them. If the email is interesting, if it supplies valuable information and offers that they might, one day, want to take up, if it contains enough personality, warmth and understanding, it won’t just keep the subscriber in the funnel. It will make them welcome the next email and even look forward to acting on it. While the sign up text provides the opening of the funnel then, each email should be one more step towards making a purchase. The next stage of the sales funnel does come with the landing page but once the subscriber has clicked through from the email, they’ve almost reached the end. The advantage of email marketing though is that while many of the people who click through will click away without making a purchase, they still remain in the funnel. Instead of falling out of the sales process completely, they only flow back where they stay until they receive the next email. 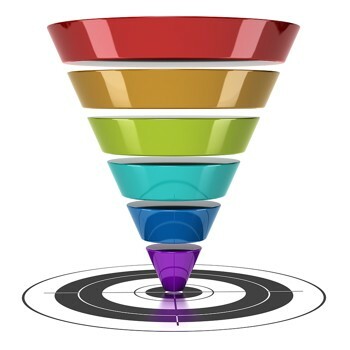 The sales funnel for email marketers then isn’t short and narrow as it is for websites. It’s wide enough to capture movement in both directions, it can grow with each email and as long the emails are interesting and deliver on the promise of the capture text, it always has a chance of delivering sales.